POLLS CLOSING AT 9 PM EST. Remember when your third grade teacher told you to “check your work?” Yeah, well, everything you need to know about verifying your vote you learned in 3rd grade. In the following video, Jackson County, WV (where stories of voteflipping about this early voting season) County Clerk Jeff Waybright demonstrates that an uncalibrated – and supposedly calibrated – ES&S iVotronic voting machine will actually flip votes. Votes flip so check your work and verify your vote. In the words of citizen Waybright, “You should never leave the voting booth without voting for who you wanted to vote for. WASHINGTON — They are some of the more memorable slip-ups or slights within the news media’s coverage of the 2008 presidential campaign. A Fox News anchor asks whether Senator Barack Obama and his wife had greeted each other with a “terrorist fist jab.” Rush Limbaugh calls military personnel critical of the war in Iraq “phony soldiers.” Mr. Limbaugh and another Fox host repeat an accusation that Mr. Obama attended a madrassa, or Islamic school, in Indonesia. Each of these moments might have slipped into the broadcast ether but for the efforts of Media Matters for America, the nonprofit, highly partisan research organization that was founded four years ago by David Brock, a formerly conservative author who has since gone liberal. Ripping a page from an old Republican Party playbook, Media Matters has given the Democrats a weapon they have not had in previous campaigns: a rapid-fire, technologically sophisticated means to call out what it considers “conservative misinformation” on air or in print, then feed it to a Rolodex of reporters, cable channels and bloggers hungry for grist. At the core of the Media Matters operation is its ability to hear and see so much of the news and commentary that streams across the nation’s airwaves, and to scan so many major newspapers and blogs. The group has an annual operating budget of more than $10 million — up from $3 million in 2004 — much of it donated by wealthy individuals with ties to the Democratic Party, including Peter B. Lewis, chairman of Progressive Insurance; Steve Bing, a movie producer; and Marcy Carsey, a television producer. Media Matters says it does not coordinate its efforts with the Obama campaign — the campaign has its own media-criticism Web site, FightTheSmears.com — though some Democratic operatives have, at the least, suggested potential items to Media Matters over the years. By Don Hazen, AlterNet. Posted October 31, 2008. The hip-hop generation was all about becoming more independent from the Democratic Party — until Obama came along. Keli Goff, a seasoned political operative and emerging pundit, penned a book last year, Party Crashing: How the Hip Hop Generation Declared Political Independence (Basic Books). The book made the case that not only was the emerging hip-hop demographic an increasingly influential force, but it was more independent than its parent “civil rights” generation, which gave its overwhelming loyalty to the Democrats, and particularly Bill Clinton, who some bitterly recall was dubbed “the first black president” by Toni Morrison. The point was that a new generation of black voters was in theory challenging the notion that a person’s skin color should color their politics, and that the label of “black voter” should be synonymous with Democrat. But Party Crashing was slightly before the Barack Obama phenomenon, in which instead of having a faux black president, voters can have a real one, if all goes as they hope on Tuesday. So did the Obama candidacy reinforce the notion that the black vote was even more Democrat than ever? Or is Obama really an “independent” who just happens to be a Democrat? AlterNet sat down with Goff and pursued this question: What does the Obama phenomenon mean for the theory that the hip-hop generation is not in lockstep with the Democratic Party — or not nearly as much as their parents where? Don Hazen: Isn’t this an extraordinary moment? Obama’s overwhelming effectiveness and success, and strong possibilities of getting elected, weren’t expected even a year ago. What has happened? Keli Goff: The main thing that happened is that the political establishment and media completely underestimated (or as President Bush might say, “misunderestimated”) the strength of some key constituencies that Barack Obama did not (underestimate) — namely younger voters as well as black voters. I sometimes joke that I would have loved to have been a fly on the wall when Obama first confided to his advisers that he believed he had a viable path to the White House — and that path was on the shoulders of younger voters and black voters. My guess is that some of his advisers either laughed or told Michelle he needed a checkup. But here we are, and yes, it is extraordinary. DH: And race, although we won’t know for sure until Nov. 4, doesn’t seem to be the huge issue that many expected. Are we entering a new level of consciousness about race in America? KG: With each passing year, race — at least race as we know it — and all of the historical baggage and conflict it entails recedes further and further from the foreground of our political conscious. This is not to say it has disappeared completely, but it no longer defines the entire conversation the way it did when my mother and others of her generation were coming up and were struggling just to have the right to vote. For one thing, each new generation in America is more multicultural and multiracial than the previous one. Generation Y has grown up in a world in which kids with Barack Obama’s unique racial and ethnic makeup really aren’t so unique anymore. As I noted in Party Crashing a few years ago, the modeling industry actually began making a point of using ethnically ambiguous models (remember the successful United Colors of Benetton ad campaign?) to appeal to young consumers whose own familial and social circles and thereby worldview — from their classmates to the music they listen to — was ethnically diverse or ambiguous, if you will. DH: Tell us in an overview way: What is the thesis of your book? Provide some examples of how the hip-hop generation — and younger African American voters — are not like their older brethren and go about politics in a different way. KG: With Party Crashing, I really set out to explore the generational divide among older black Americans of the civil rights generation and their children and grandchildren, known collectively as the hip-hop generation; more specifically, how this generational divide is impacting the American political landscape. The key difference between the two groups is really the role that race plays in shaping their political outlook. If you grew up during the civil rights era, then race was essentially the issue you voted first, second and third when you walked into the voting booth. It had to be, or quite frankly, you may not have the chance to vote again, and that type of thinking was not being dramatic, but being a realist. Today race may still color your outlook, but it is now one issue among many you may factor in when stepping into the voting booth. Ultimately deciding whether to vote for — or against — someone who does not support affirmative action at public universities is still a very different choice to make than whether to vote for someone who doesn’t believe you should be allowed to attend a public school at all. As a result, younger black Americans in general don’t feel the type of inherent connection to the Democratic Party that older black Americans have. According to our survey for the book, 35 percent of younger black Americans ages 18 to 24 are registered Independents. PALIN: That’s something that Piper would ask me! … [T]hey’re in charge of the U.S. Senate so if they want to they can really get in there with the senators and make a lot of good policy changes that will make life better for Brandon and his family and his classroom. Indeed, while Palin suggests that questions about what the Vice President does is something only her daughter Piper would ask, Palin herself asked this very question on national television in July. Apparently, she still hasn’t learned the correct answer. In modern practice the Vice President doesn’t really control the Senate. … If anyone has a responsibility to try to govern the Senate, it’s the responsibility of the two leaders. I like John McCain. I do. Why do I like John McCain? For the reason that he states in his stump speech. Because he has taken on his party. Because in the past, he has tried to shake up Washington. Remember the Gang of 14? You know, the seven Republican and seven Democratic Senators who came together to break Democratic filibustering of George W. Bush judicial nominees. McCain wasn’t very popular for “reaching across the aisle” in this case, but he did it and it got something accomplished. John McCain won the Republican nomination for reasons such as that. True dyed-in-the-wool Republicans split their votes between Mitt Romney and Mike Huckabee. It was McCain’s centrist tendencies in areas like immigration and campaign finance reform that helped him pull the upset in the Republican Primary. Now, McCain spends his days pandering to the very base of the Republican Party that is at a 15 year low in popularity. A base that comes out to his rally’s saying they want to “kill” his opponent. I can forgive McCain for (repeatedly) voting against the MLK Holiday, but I let him slide for catering to the racist wing of the Republican Party and waiting until Friday to even say one word about the tone of his audience. CAVUTO: If you had your druthers and could pick between Colin Powell or Joe the Plumber, who would you pick? 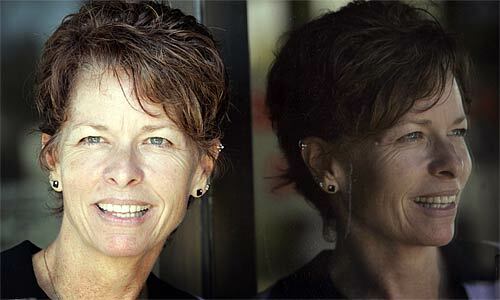 "I am not a Republican," insisted Karen Ashcraft, 47, a pet clinic manager from Ventura who said she was duped by a signature gatherer into joining the GOP. "I certainly . . . won't sign anything in front of a grocery store ever again." YPM, a group hired by the GOP, allegedly deceived Californians who thought they were signing a petition. YPM denies any wrongdoing. Similar accusations have been leveled against the company elsewhere. SACRAMENTO — Dozens of newly minted Republican voters say they were duped into joining the party by a GOP contractor with a trail of fraud complaints stretching across the country. Voters contacted by The Times said they were tricked into switching parties while signing what they believed were petitions for tougher penalties against child molesters. Some said they were told that they had to become Republicans to sign the petition, contrary to California initiative law. Others had no idea their registration was being changed. Newspaper stories from Palin’s rally from myself and Joe Killian. Update: Bloggers note: there is editing throughout this post at 10 a.m. or so this morning to clean up grammar and spelling errors committed at the end of a 16 hour day. As well, some fixes have been made with regards to quote marks that did not publish correctly. My apologies to the English teachers in the audience. Joe was working with me on a package for tomorrow’s newspaper covering Gov. Sarah Palin’s visit to Elon and Greensboro. Let me just digress for a second. I sometimes supervise people. Much more often, I work in teams with folks. I’m usually the old fart in the group so I feel responsible for them. The last thing I ever want to hear is that one of my people got hurt on assignment. Usually the worry has to do with covering a traffic accident along a highway or a natural disaster like a flood, where conditions are inherently dangerous. What I don’t expect is for some troglodyte at a campaign rally to decide that the proper way to express his frustration with Democrats, Barack Obama or the “left-wing liberal media” is to commit assault on a colleague. As you probably know, the crowds at McCain-Palin events have gotten, um, saucy as of late. My bossblogs about that here. Covering Sen. John McCain’s appearance in Wilmington Monday, you could definitely sense some of that vibe. WASHINGTON — Activists at a conservative political forum snapped up boxes of waffle mix depicting Democratic presidential candidate Barack Obama as a racial stereotype on its front and wearing Arab-like headdress on its top flap. Values Voter Summit organizers cut off sales of Obama Waffles boxes on Saturday, saying they had not realized the boxes displayed “offensive material.” The summit and the exhibit hall where the boxes were sold had been open since Thursday afternoon. David Nammo, executive director of the lobbying group FRC Action, said summit organizers were told the boxes were a parody of Obama’s policy positions but had not examined them closely. Republican Party stalwarts Newt Gingrich and Mitt Romney were among speakers at the forum, which officials said drew 2,100 activists from 44 states. While Obama Waffles takes aim at Obama’s politics by poking fun at his public remarks and positions on issues, it also plays off the old image of the pancake-mix icon Aunt Jemima, which has been widely criticized as a demeaning stereotype. 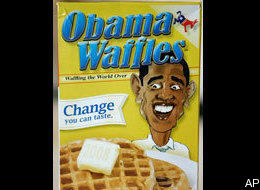 Obama is portrayed with popping eyes and big, thick lips as he stares at a plate of waffles and smiles broadly. Placing Obama in Arab-like headdress recalls the false rumor that he is a follower of Islam, though he is actually a Christian. 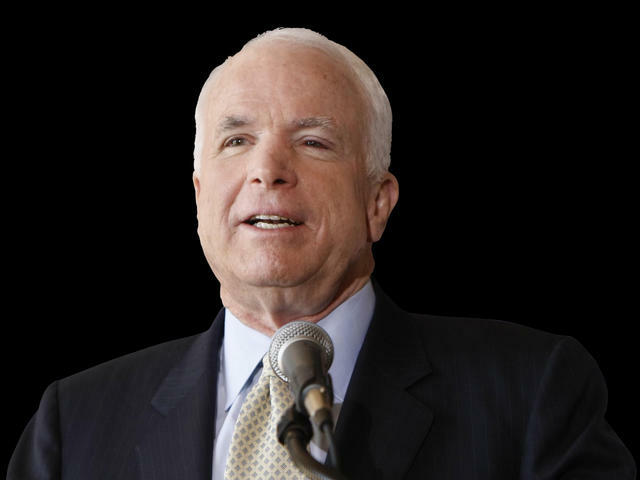 LEBANON, Ohio — John McCain took a risk in picking little-known Alaska Gov. Sarah Palin as a running mate, but now the campaign’s playing it safer. She’s sticking to a greatest hits version of her convention speech on the campaign trail and steering clear of questions until she’s comfortable enough for a hand-picked interviewer later this week. More than 40 million people tuned in last week to listen to the speech from Palin, the 44-year-old, first-term governor whom McCain announced as his surprise vice presidential pick just days before. Since then, that basic script is all anyone has heard from her publicly, and her only interaction with the media was a brief conversation with a small group of reporters on her plane Monday _ off the record at her handlers’ insistence. Associated Press reporters were not on the plane, but an aide told the journalists on board that all Palin flights would be off the record unless the media were told otherwise. At least one reporter objected. Two people on the flight said the Palins greeted the media and they chatted about who had been to Alaska, but little else was said. Editor’s note: Much of the best information on the 2008 election can’t be found in newspapers or magazines, or TV and radio, or websites — it’s on email. The article below is an email response sent out by critics of McCain’s RNC speech singling out inaccurate statements the GOP nominee made to the nation on critical issues of the day. As I predicted earlier today, Sarah Palin did just fine. In fact, she delivered a brilliant speech. It was a classic Republican speech–written by Matthew Scully of the Bush speechwriting shop–chock full of conservative populism, a cultural “torpedo” as Chris Mathews is saying as I write this, aimed directly at Barack and Michelle Obama. She was far more effective, using fewer words than the over-the-top Rudy Giuliani, in tearing down the Obama candidacy. There was not much substance–issues don’t matter, remember?–and her description of Obama’s policies, particularly his tax policies, was quite inaccurate. But that hardly matters. Palin established herself as a major-league performer, a very effective messenger for the perennial Republican themes of low taxes and strong defense. And a new theme–government reform–that changes the terrain of the election and will have to be forcefully countered by the Democrats. Obama will have to be every bit as sharp–and down to earth–as he was in his speech last week as this goes forward. Last week, when Bill Clinton began to speak, I thought: this turns this lugubrious convention around. I thought the same as Palin spoke tonight. John McCain, not nearly the speaker that Palin seems to be, has a tough act to follow tomorrow night.